The dreams of thousands of girls are dashed… Dan is tying the knot. 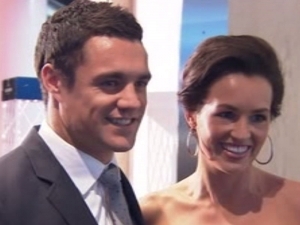 To be honest with you, I never saw the big attraction of Dan Carter – not on the field or even in his Jockeys. But he started to appeal to me more when I heard he had been dating the same girl for the last 5 years!! That type of commitment says alot in this day and age. And lets hope he didn’t have any Mike Tindall moments in that time. Plus she looks down to earth and not the usual bimbo type wag you’d expect. So down to the ceremony – it was held at the luxury Lake Timara Lodge near Blenheim was conducted in the upmost secrecy, with guests reportedly told not to take photos and an aerobatic display booked overhead to prevent nosy media from flying over the venue. The media black out was part of a deal with the Australian Women’s Weekly magazine which is rumoured to have paid around $50,000 for exclusive rights to the wedding coverage. Dan and his new bride, former Black Sticks striker Honor Dillon, are now said to be looking forward to a romantic honeymoon. Although a veil of secrecy surrounded the ceremony some details are starting to emerge through the cracks. Dillon is said to have looked “stunning” in a ivory-coloured silk satin dress, with her face covered by a light tulle veil which trailed to the ground behind her. The colour of the dress was said to have set off Dillon’s tan and with a plunging “V” down the back. The front of the dress is reported to have been modest with a small V-neck and inch thick straps over her shoulders, while a figure hugging bodice opened out into an A-line skirt. Kiwi singer Hayley Westenra entertained the gathered friends and family before the bride arrived, with All Blacks Richie McCaw, Ali Williams and former coach Graham Henry among the guests. Dillon was led down a grass aisle to a lakeside altar , with guests seated on white chairs, where she was greeted by Kings College chaplain Warner Wilder, the Sunday Star Times reported. The service sheet listed Dillon’s bridesmaids as Amy-Kate Snowise, Amber Edgar, Michal Wells and Jessica Bradley, and Carter’s groomsmen as Ben Jones, Jimmy Cowan, Doug Tausili and Simon Walsh. The service including traditional hymns and Christmas carols and Carter’s sister gave a reading at the 45-minute ceremony. ”Honor and Dan came together as friends. Today they pledge not only their love, but also the strength, warmth and, most importantly, the fun of true friendship,” she said. The party went on till around 1am with entertainment provided by a four-piece covers band and a lavish fireworks display.